​Following a vegetarian diet can be tricky, and taking up a low-FODMAP diet is certainly a challenge. Imagine being vegetarian AND taking up the low-FODMAP diet – believe me, that can be downright hard. Yet it can be done – I’m living proof! 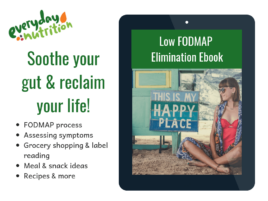 I came across the low-FODMAP diet through my dietetic studies at university. When I was later diagnosed with IBS, I decided to give it a try. It’s considered the gold standard for treatment and I’m finding it helps ease my symptoms. However, if you don’t eat meat, whether for health or ethical reasons, it becomes a little more difficult to adhere to this diet. The protein-rich plant-based foods most vegetarians rely on – beans, lentils, chickpeas – can be consumed on the low-FODMAP diet, but only in very small amounts (see Tip 3 below). The low-FODMAP diet isn’t a long-term eating plan – you only follow it for 2-6 weeks and then start a reintroduction phase to determine to which foods you are intolerant to, ideally under the supervision of a dietitian. Later, you’ll move onto a modified FODMAP diet, limiting the foods you can’t consume, but incorporating any high-FODMAP foods you’ve discovered your gut can tolerate. Despite my training as a dietitian, I initially struggled to incorporate the low-FODMAP diet into my vegetarian lifestyle. I came to realise the key to making it work is planning and preparation. Using myself as a “guineapig”, I’ve come up with a few tried-and-tested suggestions to help weave low-FODMAP eating into your vegetarian life. 1. Invest in the Fodmap Friendly App or Monash Low Fodmap app for your smartphone. These are really useful tools to use when grocery shopping or planning meals and portion sizes. *firm tofu, eggs, Greek-style strained yoghurt (my go-to is Chobani) or coconut yoghurt (there are many – Over The Moo is great), lasagne sheets (I use Latina Fresh gluten-free sheets), hard cheese, milk – either lactose-free milk, or plant-based “mylk” (ensure you choose a low-FODMAP variety, e.g. So Good soy milk). ​3. Stock your cupboard with low FODMAP staples. I always have some spaghetti sauce (e.g. FODMAP certified Leggo’s “Classic Tomato with chunky tomato and herb” or FODMAPPED for You pasta sauce range), rice, quinoa, corn chips or brown rice chips (I use Sun Rice), tinned lentils and chickpeas. NOTE: Tinned lentils and chickpeas are low FODMAP as the GOS are water soluble, so leach into the water. Ensure that you thoroughly rinse them before use and don’t use the chickpea or lentil water for cooking. ​​5. If you learn that your dining-out options are going to be limited, consider having something to eat before you leave home. If I find the FODMAP-friendly pickings a little slim, I often settle on a plain Greek salad with no onion and perhaps a slice of bread (but not garlic bread). 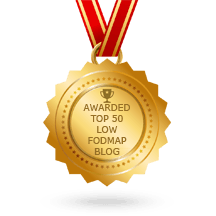 I know this sounds boring, but remember this low FODMAP diet is not forever. After the elimination, you’ll begin the reintroduction phase and determine which foods you can eat again. 6. Aim to eat balanced meals at home and, if possible, when you’re eating out. This means fill half the plate with vegetables; a quarter of the plate with such carbohydrates as rice, low-FODMAP pasta, sourdough bread (note: the Australian Baker’s Delight chain has released a LoFo bread); and the remaining quarter with protein-rich foods – think cheese, small amounts of chickpeas, lentils, Greek yoghurt, small amounts of nuts and/or eggs. If it’s not possible to get these all in one meal, try to have whatever you’ve missed as a snack. It can be hard to balance everything, but luckily small, regular meals work well in managing IBS. Some days I’ll have a couple of slices of sourdough toast spread with peanut butter. Then, an hour or two later, I’ll have a big plate of steamed vegetables. Do what works for you and your lifestyle. 7. Accept that some meals won’t be masterpieces – they don’t have to be. There’s nothing wrong with two simple slices of sourdough toast topped with scrambled eggs and a side of steamed spinach, followed by Greek yoghurt and fresh strawberries for dessert – it’s practically a feast! 8. Seek support. I recommend seeing a dietitian who specialises in the low-FODMAP diet. 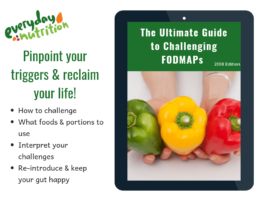 Not only will the dietitian be able to assist with finding which FODMAPs you are intolerant to and in what amounts, but he or she will help you grow in confidence as you face the eating challenges ahead. Jenna is an Accredited Practising Dietitian, working as a nutrition consultant for the past five years. She has been part of several significant and successful initiatives, including the national Medibank, AHM and HCF health coaching programs, the Veterans Heart Health program and the Get Healthy Service. Through this work, she has coached thousands of individuals, helping them achieve their nutrition and health goals. With experience across all areas of nutrition, Jenna has developed a special interest in food intolerances since her IBS diagnosis. She is passionate about whole foods and loves sharing with others the benefits of good nutrition. To find out more about Jenna, visit her website www.thenutritioncentre.com.au or to follow Jenna’s low-FODMAP vegetarian journey, check out her Instagram account, @dietitian_jenna. It features her own recipes, which may inspire your cooking. Feel free to message her via Instagram if you have any queries.